Unlike many other fishing grounds there is very little structure to work when fishing offshore, south of Martha’s Vineyard. Basically the only forms of structure you have are temperature breaks from warm eddies moving in from the Gulf Stream, floating debris and high flyers. The challenge is that you’re canvassing large areas in a place know to host as vast number of different baitfish, including but not limited to: spearing, butterfish, puffer fish, herring, ballyhoo, flying fish and many others. 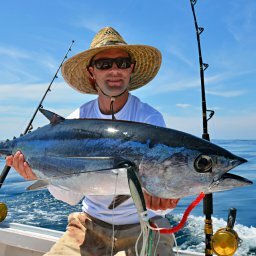 As far as tuna go sometimes you’ll see skipjacks, bonito and false albacore but the main targets off the Vineyard are bluefin tuna, yellowfin tuna and the occasional long fin albacore. You’ll also find mahi, occasional wahoo, white marlin, blue marlin and mako sharks in your spread too. Gear: Not including the Canyons, “Inshore” offshore includes spots like The Star, The Fingers, Gordon’s Gully, The Dump, The Claw and Southwest to Coxes Ledge. The gear you should bring needn’t be heavy duty. I use 20-pound class reels loaded with 40-pound test mono with 80-pound test braid for backing. The biggest fish I have ever caught south of the Vineyard was my first one, back in 1992, an 80-pound yellowfin and was easily landed on this sized gear. 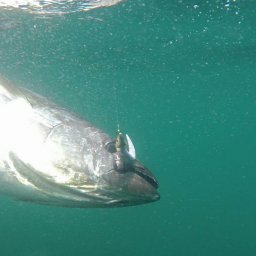 If you are new to the offshore game, heavy striper gear will work in a pinch, just make sure you have at least 100 yards of mono on top of braid or 300 yards of mono. Popular colors for south of the Vineyard lures: There are endless colors available for offshore lures. However, the time-tested favorites south of the Vineyard are pink (an attractor color, often used in rough seas for visibility); green (a time tested favorite and a great mackerel imitator); rainbow (an attractor color); white (a great imitator of ballyhoo, herring and other typical bait fish); and Blurple (great for dark conditions or the contrasting other color lures in the spread). Green Machines: Various forms of Green Machines have been around since the advent of offshore fishing. South of the Vineyard, the 9-inch version is the popular size. They are often fished as a single bait behind a bird, daisy chain behind a bird, or naked off an outrigger. High Speed Mini Bulb Squids: Many anglers associate bulb squids with fishing for giant bluefin tuna, but the smaller, lighter versions are dynamite for fishing in this area. When rigged on lighter bars they have minimal drag, pulse in smooth water and importantly, don’t tumble in rough seas. 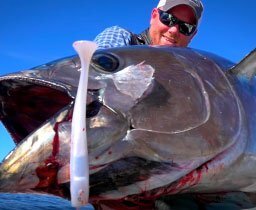 Skirted Ballyhoo or Imitator: At Salty Cape / Hogy we are fans of artificials, but we also know that ballyhoo are an important trolling bait offshore. We like to fish them off an outrigger or way, way back (also known as WWB). 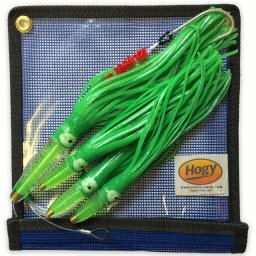 An imitator such as a Hogy Blue Max with a soft bait in lieu of the ballyhoo can be an excellent way to dial in color to either match the hatch or increase visibility in rough seas. Jet Heads: Jet heads leave a nice bubble trail that leads fish to your spread. I fish jet head off my center rigger, way back. Cedar Chains: No spread would be complete without the cedar chain fished off the flat line clip. 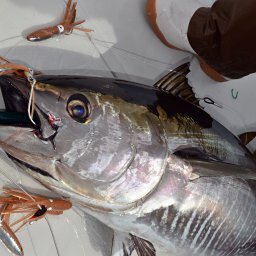 For whatever reason, long fin albacore love the cedar chains – the nastier they get from fish attacks, the better they will catch. ALWAYS have one in your wash. The Bird: A bird is not a lure in itself, but serves as a teaser when attached in front of the lure. Spreader Bars: Nothing fills out the spread like a spreader bar. South of MV trolling is relatively fast, so a light weight build squid bar is best for these speeds. Look for one that pulses. Best fished off the short riggers.